"Come Over" is a song written by Sam Hunt, Shane McAnally, and Josh Osborne and recorded by American country music singer Kenny Chesney. It was released in May 2012 as the second single from Chesney's 2012 album Welcome to the Fishbowl. The song is set in the key of D-flat major with a main chord pattern of B♭m7–G♭sus2–D♭–A♭. Co-writer Josh Osborne said that when writing the song, he and the co-writers were composing melodies when co-writer Sam Hunt suggested to make it a "kind of desperate thing, like the guy is pleading with this girl to come over." Upon reaching the chorus, they decided to repeat the phrase "come over" five times to "[get] into the emotion of the situation." Billy Dukes of Taste of Country gave the song three and a half stars out of five, writing that "the songwriters show power in efficiency, yet the singer never really conveys the physical need for this woman that the repetition begs for." Matt Bjorke of Roughstock gave the song four stars out of five, saying that it "shows off a completely different side for Kenny Chesney and it manages to feel immediate and current in ways that 'Feel Like a Rock Star' didn't." "Come Over" debuted at number 24 on the U.S. Billboard Hot Country Songs chart for the week of June 2, 2012. After spending eleven weeks on the Hot Country Songs chart, "Come Over" became Chesney's twenty-second number one single for the week of August 11, 2012. The song has sold over a million copies in the US. Co-writer Sam Hunt recorded a version of "Come Over" for his acoustic mixtape Between the Pines (2013). This recording entered the Billboard Hot Country Songs chart at number 42 following the mixtape's 2015 re-release on MCA Nashville. As of November 2015, Hunt's version has sold 14,000 units. 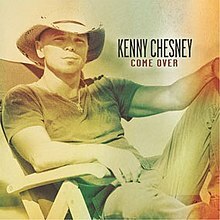 ^ "Kenny Chesney Unveils New Single, "Come Over"". Country Music Television. May 14, 2012. Retrieved June 6, 2012. ^ "'Come Over' sheet music". MusicNotes.com. Retrieved 12 August 2012. ^ Paxman, Bob (August 20, 2012). "Story Behind the Song". Country Weekly. 19 (34): 20–21. ISSN 1074-3235. ^ Dukes, Billy (May 14, 2012). "Kenny Chesney, 'Come Over' – Song Review". Taste of Country. Retrieved June 6, 2012. ^ Bjorke, Matt (May 14, 2012). "Single Review: Kenny Chesney - "Come Over"". Roughstock. Retrieved June 6, 2012. ^ Wyland, Sarah (June 5, 2012). "Watch Kenny Chesney's Steamy New "Come Over" Video!". Great American Country. Retrieved June 6, 2012. ^ Morris, Edward (May 26, 2012). "Carrie Underwood Still Champion With Blown Away". Country Music Television. Retrieved June 6, 2012. ^ Paul Grein (31 October 2012). "Week Ending Oct. 28, 2012. Songs: Chris Brown's Comeback". Chart Watch. Yahoo Music. ^ "Kenny Chesney Chart History (Canadian Hot 100)". Billboard. ^ "Kenny Chesney Chart History (Hot 100)". Billboard. ^ "Kenny Chesney Chart History (Hot Country Songs)". Billboard. ^ "American single certifications – Kenny Chesney – Come Over". Recording Industry Association of America. Retrieved July 23, 2012. If necessary, click Advanced, then click Format, then select Single, then click SEARCH. ^ McClellan, Laura (October 28, 2015). "Sam Hunt Reissues Acoustic Record on 1-Year Anniversary of 'Montevallo'". Taste of Country. Townsquare Media. Retrieved 16 November 2015. ^ "Sam Hunt – Chart history: Country Songs". Billboard. Retrieved December 1, 2014. ^ Bjorke, Matt (November 9, 2015). "Top 30 Digital Singles: November 9, 2015". Roughstock. Cheri Media. Retrieved 16 November 2015.